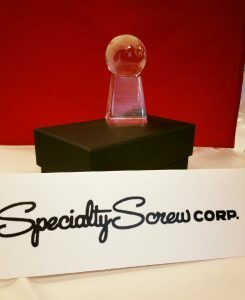 Top automotive supplier Yazaki recognized Specialty Screw Corporation with an Environmental, Health & Safety Supplier Award at its annual awards ceremony on Tuesday, June 6, Specialty Screw Corporation was chosen from Yazaki’s top 97 suppliers in North and Central America. Specialty Screw Corporation provides special cold headed parts primarily to the automotive industry utilizing quick response manufacturing for their customers. Their dedication to process control and improvement while maximizing efficiencies results in cost savings, reduced lead times, and maximized production to their customers. Specialty Screw Corporation works hard to establish a greener tomorrow, by always going back to their core values of Culture, Ethics, Respect, Community, and Sustainability. Specialty Screw Corporation has been able to use Solar Panels; HVAC Improvements; updated LED lighting; and updated equipment to conserve energy. They have made changes to reduce their oil and water usage. Wellness programs are a big part of how Specialty Screw Corporation is promoting a healthy work life balance for its employees. Offering free chair massages and onsite flu shots to promote health along with lunch and learn seminars. “Our environmental policy is to strive for continuous improvements on environmental initiatives, such as minimized solid landfill waste, preventing pollution, and conserving natural resources,” says owner and CEO Russell Johansson. Held to honor World Environmental Day, the Yazaki Environmental, Health & Safety Supplier Award program recognizes suppliers who have made significant contributions to the preservation of the environment through their manufacturing, production, and delivery processes and have exceeded others in their effort to reduce their impact on the environment. Yazaki established this program in 2007 as the benchmark for all Yazaki companies and affiliates throughout North and Central America. Yazaki’s commitment to the environment spans the globe as the Company’s global business segments all aim to support safe and eco-friendly practices. Aside from automotive products, Yazaki produces equipment that support the efficient use of electricity, gas, solar heat, and other energy sources, as well as environmentally-friendly air-conditioning units and additional products and services aimed at reducing environmental impact to local communities. Specializing in Cold Formed Parts for the Automotive & Non Automotive Marketplace. Automotive is not our only specialty! We manufacture special parts for many other industries such as lawn and garden, plumbing, residential window and door hardware, firearms, hand tools, and a wide variety of other specialty parts. Please call 815-969-4100 for more information.